Every organization has a set of rules and regulations which should be followed by everyone without fail. In case of any misconduct the higher officials of the organization take a disciplinary action against the person. However, this is not just a verbal action. This requires a fair amount of paperwork with the person being served a proper notice. It is for this purpose that disciplinary action forms are used. These Action Forms comprise of the essential segments and content that guards the whole process. 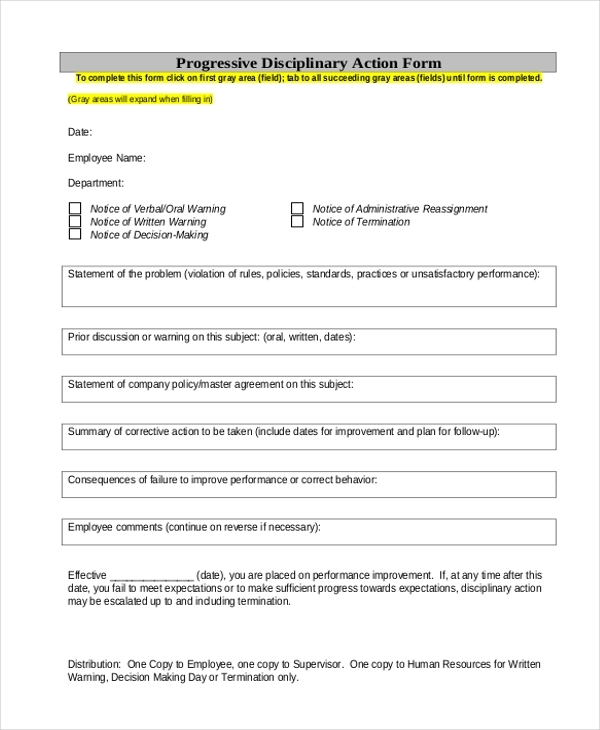 Business and service organizations can use this form to take a disciplinary action on their employees who may have failed to keep up with the regulations of the firm. The form comprises of segments where the employee details have to be entered. The user needs to choose the reason for the action from the options listed in the form. You can also see Employee Action Forms. 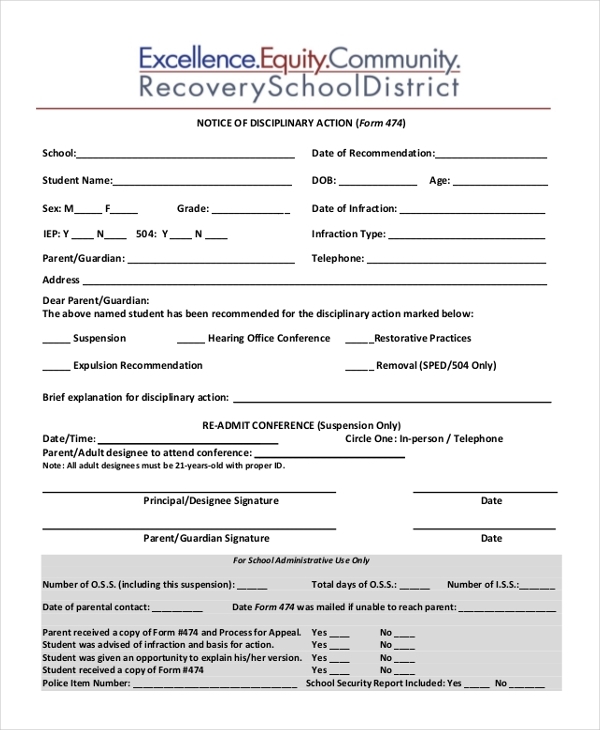 This form can be used by educational institutions to take a disciplinary action against the students for their misconduct or failure to keep up with the rules. The authority concerned is required to fill in the details of the student, the reason for the action and the action to be taken. When an organization has different levels of warnings and punishments for the same mistake being committed repeatedly, it can use the aforesaid form for the purpose. It use this form to notify the person about the actions that would be taken against him if the mistake is repeated. 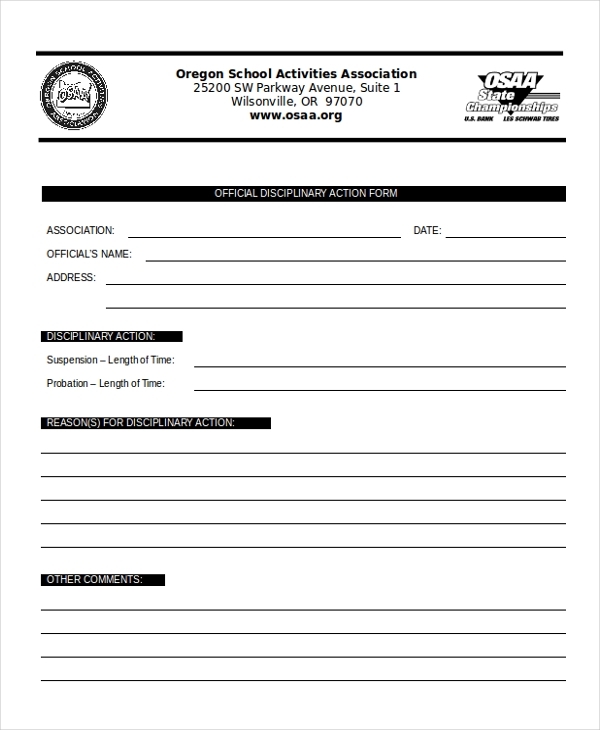 This form can be used by the administrative department of educational institutions to design a unique disciplinary action form. This form gives the user an idea of the format to follow and the segments to include in such a form. The user can however make changes to the existing design as per his needs. You can also see Corrective Action Forms. 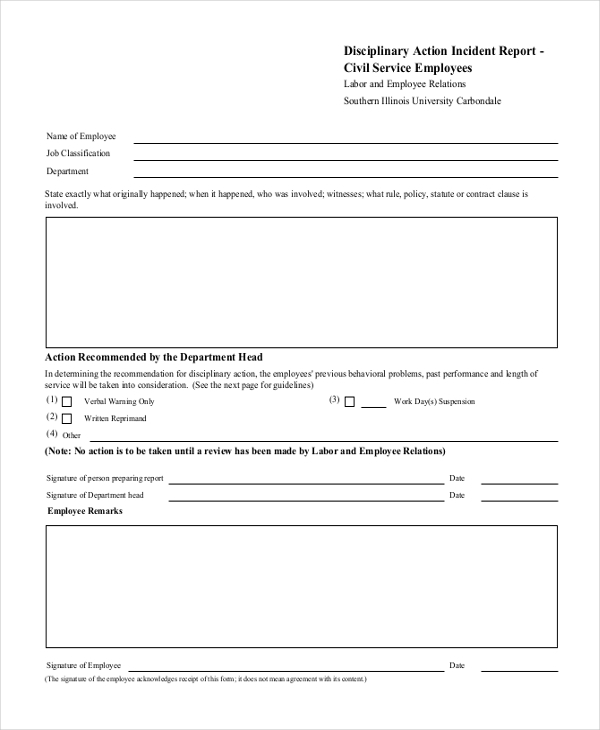 When an organization wishes to notify its employees about an impending disciplinary action against one or more of their colleagues, it can use this form to design such a notice. This form gives them an idea of the right way to draft the content and the details to be included in the notice. This form is usually used by government agencies to take a disciplinary action against their employees. The form gives them an idea of the format to be followed when designing such a report. The user can add in a number of options to the form which helps in reducing the paperwork and simplifying the whole process. You may also see Disciplinary Action Forms. 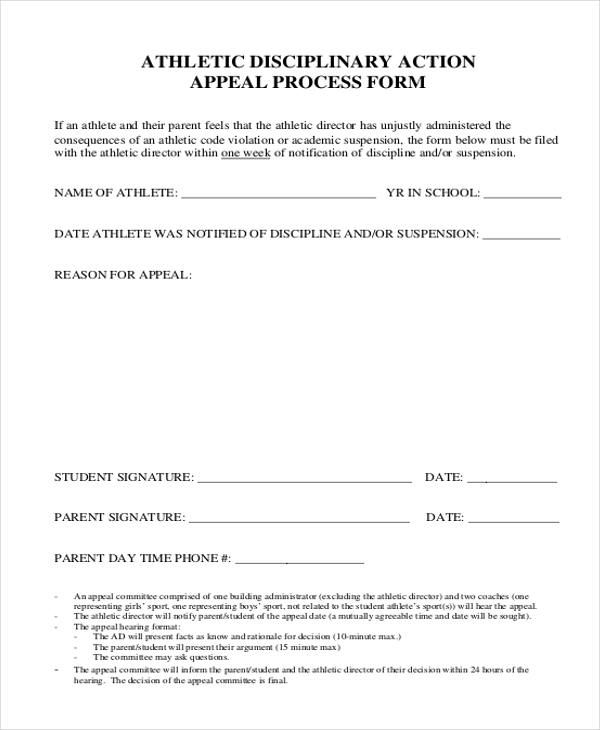 Generally used by sports clubs and associations, this form allows the authorities to appeal for a disciplinary action to be taken against one or more of the athletes. The person making the appeal is required to list the reason for which the action is being sought. 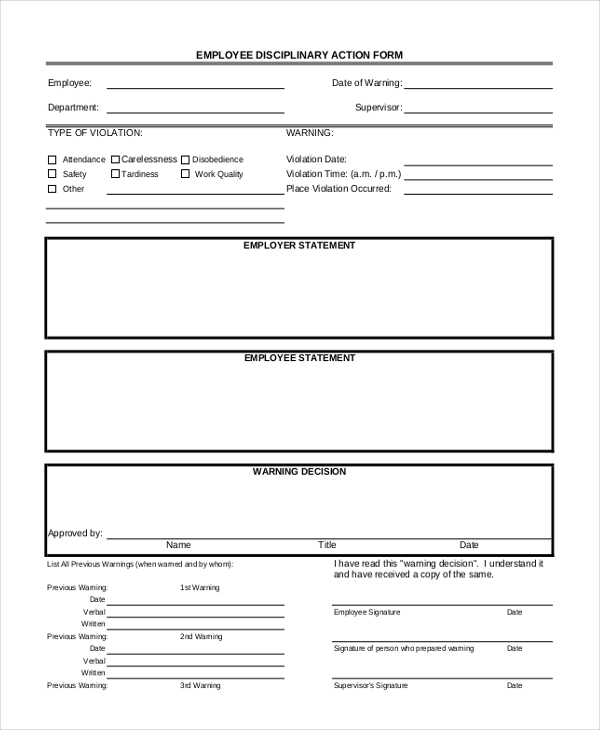 This form can be used by private as well as government agencies to design a unique disciplinary action form. With a proper format and essential segments in place, it becomes easier for the user to personalize this Employee Write Up Forms and then add in the relevant details. What are The Benefits of Using Disciplinary Action Forms? Not sure how to design a disciplinary action form? Fret not. We have a wide range of such forms to choose from. Find the one that is apt for you and then download it. Easy to download and customize, these forms help you come up with a unique document in a jiffy. You can also see Sample Personnel Action Forms.